UK Foreign Secretary Jack Straw has warned Syria it risks being "treated as a pariah" if it fails to withdraw its forces from Lebanon. In a BBC interview, Mr Straw said more UN peacekeepers could be deployed in Lebanon to replace Syrian troops. His comments come a day after Russia and Saudi Arabia joined growing calls for Syria to withdraw its forces. 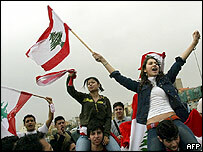 Syria has come under intense pressure to pull out of Lebanon since a massive car bomb blast there on 14 February. Lebanese opposition groups have blamed Syria for the attack, which killed popular former Lebanese Prime Minister Rafik Hariri - a charge Syria has strongly denied. Mr Straw said Syria had no choice but to leave Lebanon, where there are about 15,000 Syrian troops and thousands of Syrian intelligence personnel. "It has got to, it is very clear," he said, noting "every one of its neighbours is saying you have got to leave". He said Syria had to withdraw "in a sensible, swift but phased way" in order for the country to "come back into the fold of the international community". "If they don't," he said, "they really will be treated as a pariah." Mr Straw said members of the UN Security Council had discussed deploying more peacekeepers to Lebanon in the event of a Syrian pullout. "It is possible that as part of a phased withdrawal... there could be some more peacekeeping troops," he said. Syrian President Bashar al-Assad will announce a troop pullback to eastern Lebanon in an unscheduled speech to the Syrian parliament on Saturday, news agencies quoted unnamed Lebanese sources as saying. A 1989 agreement that ended the Lebanese civil war calls for a phased withdrawal of Syrian troops, beginning with redeployment to the eastern Bekaa Valley. Syria's Deputy Foreign Minister Walid al-Muallim, who held talks in Moscow with his Russian counterpart Sergei Lavrov on Friday, said the two countries shared the same view about Lebanon. On Thursday, Mr Lavrov said Russia - Damascus' long-time ally - cautiously supported calls for Syria to withdraw from Lebanon. Stepping up the pressure, Saudi Arabia's Crown Prince Abdullah also said a Syrian withdrawal would ease the international pressure on Damascus and help defuse the crisis.